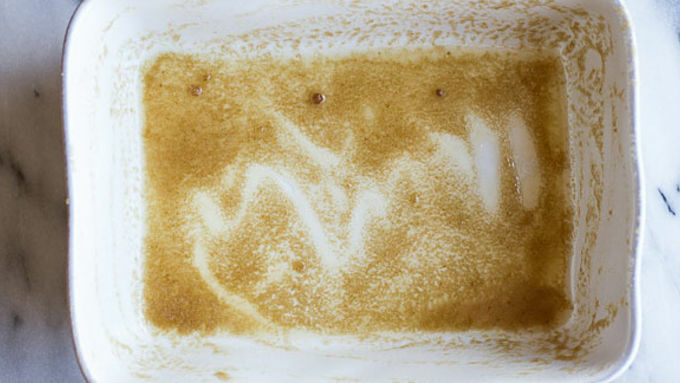 In a small bowl, combine brown sugar and melted butter. Pour into the bottom of a 9x13 inch baking dish. 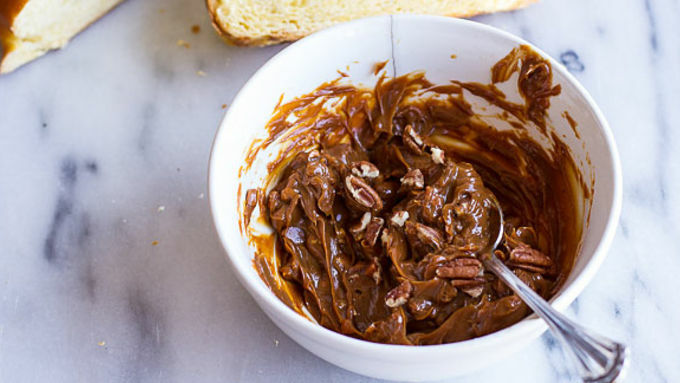 In another small bowl mix together the dulce de leche (or caramel) and 1/4 cup pecans. Using a paring knife, carefully make an inch (or so) incision in the tops of each slice of bread to create a pocket. Smear the insides of the pockets with 1 1/2 tablespoons (or more if you wish) of the caramel pecan mixture. 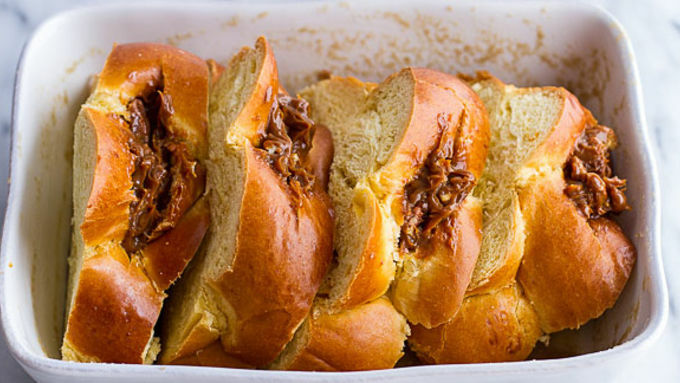 Arrange the stuffed slices of bread in the baking dish, overlapping if necessary. 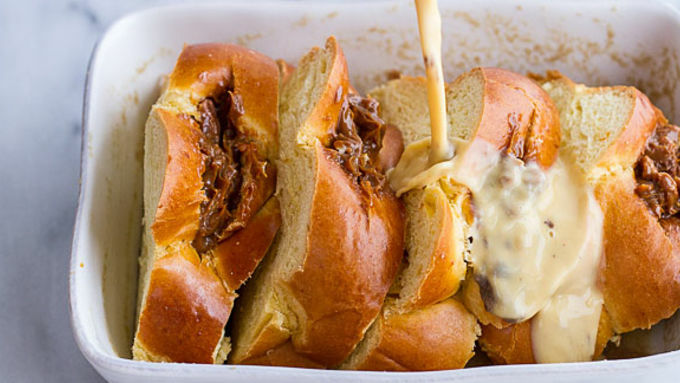 Make sure that the tops of the bread are facing up so the caramel does not melt out. Combine milk, eggs, vanilla, salt and cinnamon in a bowl and pour evenly over bread slices. Sprinkle 1/2 cup chopped pecans over bread slices. Wrap tightly with plastic wrap and place in the refrigerator for 4 to 12 hours. In the morning, take the casserole out of the fridge for at least 10 minutes while you are preheating your oven to 350°F. Make sure all bread slices are evenly coated in egg mixture (redistribute egg mixture if necessary). Bake casserole for 30-35 minutes. If top starts browning too quickly, place a foil loosely over the top of the casserole for the last 10 minutes or so. Meanwhile, combine the water, brown sugar and cinnamon sticks in a medium sauce pot. Bring the mixture to a boil and then reduce heat and simmer 8-10 minutes. Remove from the heat and let cool slightly until ready to serve. Remove French toast from oven and let it cool slightly before serving. Serve with chopped pecans and a drizzle of the cinnamon syrup. 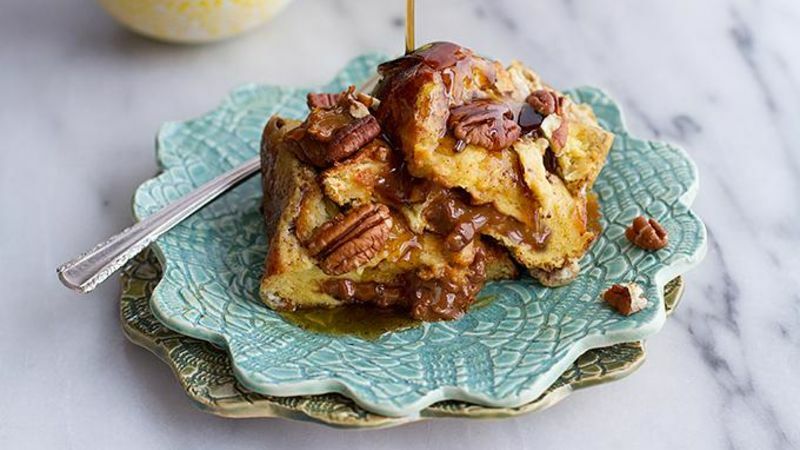 Stuffed with thick caramel and drizzled with cinnamon pecan syrup, this is one breakfast you won't sleep through! 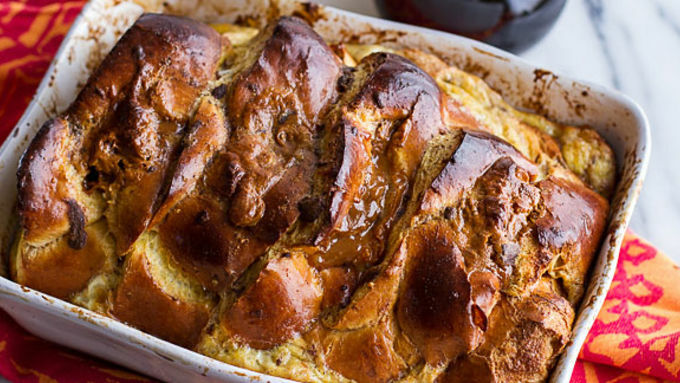 Cinco de Mayo needs to start off right, and this French toast is just the thing. It’s stuffed with a super thick Mexican caramel, called dulce de leche, and mixed with toasted pecans. 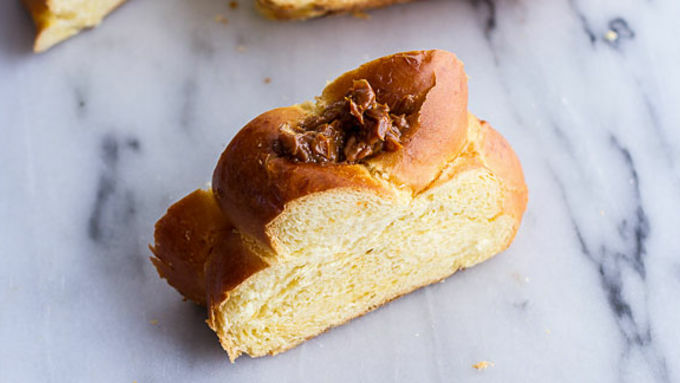 You can buy dulce de leche at the store or make your own. (See my note at the end of this article about that.) 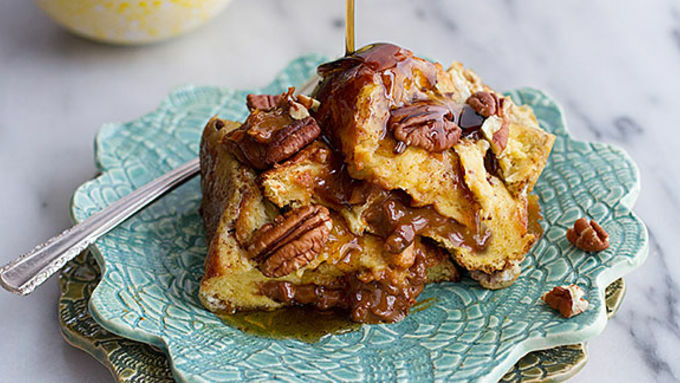 Once it's baked, the French toast is drizzled with a super simple homemade cinnamon pecan syrup. Oh man, it is so good. The best thing about this dish (besides it being super delicious) is you can prep it the night before – so come morning, all you have to do is bake, serve and eat. Yes!! Slice and serve with the cinnamon syrup. Welcome to breakfast done right!